Manual Handling Regulations In The Mailroom. Manual handling relates to the moving of items either by lifting, lowering, carrying, pushing or pulling. But it’s not just a case of ‘pulling something’ due to the weight of the item, although this can be a cause of injury. Even in an office or mailroom environment, injuries can be caused because of the amount of times you have to pick up or carry an item, the distance you are carrying it, the height you are picking it up from or putting it down at (picking it up from the floor, putting it in high pigeon hole) and any twisting, bending stretching or other awkward posture that may be required by the task. Work related manual handling injuries can have serious implications for both the employer and the person who has been injured. Employers may have to bear substantial costs, through lost production, sickness absence, costs of retraining, wages/overtime to cover for the absent person and potentially compensation payments. The injured person may find that their ability to do their job is affected and there may be an impact on their lifestyle, leisure activities, ability to sleep and future job prospects. It is essential therefore that employers manage the risks to their employees. The Manual Handling Operations Regulations 1992 (as amended) require employers to carry out risk assessments for all handling operations. If possible you should not carry out any manual handling tasks. Where these are necessary, the risks can be mitigated by using some equipment such as load levelling trollies, powered trucks or lifting equipment. How To Ensure Your Mailroom Runs Efficiently. A well-designed mailroom should maximise the amount of mail that can be processed and minimise the amount of manpower required, while maintaining an efficient and reliable service. However, before these boxes can be ticked, security and employee safety are priority areas. By their very nature mailroom related tasks can often include heavy lifting, awkward postures, lots of standing up and a whole host of tasks that are both intensive and repetitive. To prevent health related problems occurring, your furniture has to be fit for purpose. Benches and packing stations should be sturdy enough to hold machinery such as franking machines and scales, and many are also height adjustable which helps employees to maintain a healthy posture. 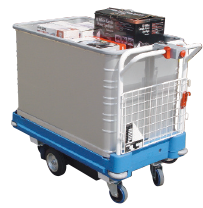 Trolleys should be easy to manoeuvre and designed so heavy items can be loaded and unloaded with minimum effort. They should also improve productivity through efficient transportation and some even enable mobile sorting. The best mailrooms will always have clearly defined systems in place that everyone in the organisation is aware of. This also means if an employee is absent, the mailroom can still function but there has to be controls in place because security can be a major issue. This is especially true in organisations that send or receive high value items or in workplaces that are open to members of the public where it might be necessary to install controlled-access systems or use locking sorter systems to keep mail safe in certain areas. Businesses can also face attacks via the postal system and in extreme cases these can include chemicals and even explosives so it makes sense to continually review mailroom procedures and if necessary invest in specific training to help employees identify suspect packages and potential dangers. The Power Go-Far is ideal for transporting mail and packages around large sites. The highly manoeuvrable, powered trolley is easy to operate and takes the strain out of moving heavy loads over long distances. Depending on your requirements, the Go-Far can be fitted with a range of bespoke attachments. The long basket is good for files or single packages, the sorting unit is ideal for mail distribution and the load levelling container (as illustrated) is for heavier items and reduces the bending and lifting required from the operator.